I guess this must be the ultimate in posh nosh for dogs and it comes to you all the way from New Zealand! 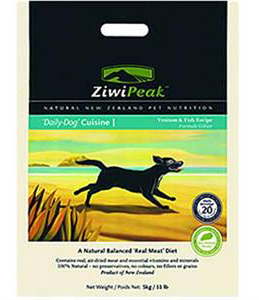 What they say is "From a unique land of plenty, comes ZiwiPeak a complete natural health range of ULTRA PREMIUM MEAT pet food products which are an equivalent to a raw diet, prepared with care beneath the Bay of Plenty's celebrated peak, Mount Maunganui, New Zealand. "The peak of health for cats and dogs depends on the sustenance they get from 'RAW MEAT' nature's true diet and ZiwiPeak is the equivalent to a true raw diet. 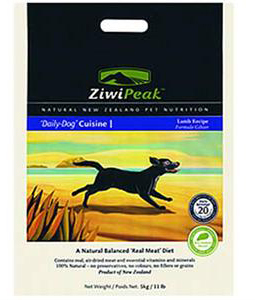 The ZiwiPeak range is formulated on the same balance of meat ingredients - meat, heart, liver, kidney, cold washed green tripe and bone, plus natural vitamins and minerals, that cats and dogs would find by hunting in the wilderness." The jury is out on the benefits of an ancestral tyoe of diet as research suggests that a dogs digestive system has evolved to cope with a human rather than a wolf-like diet. But what you get here is possibly the most expensive dog food out there! There's nothing wrong with the ingredients that go into Ziwi Peak, simply that the end result is so very expensive. Nutritionally it is different to many foods in being so high in protein and fat, so be careful to introduce it gradually if changing diets. Expect to pay up to £99 for a 5kg pouch!